This is the first year in quite some time that I have not made a Summer Mix. It used to be something of a tradition, like watching Le Tour on the telly of an evening, or changing into shorts as soon as I got in from school, regardless of the weather. Recently though new traditions have developed, like watching the Freaks and Geeks DVD box set which in turn leads to playing The Who and American Beauty. And much as I hate to admit to digging The Dead, I do have to grudgingly agree that it is indeed one of the greatest albums ever. Of course I shudder to think what my teenaged self would have made of such a statement, but then again my teenaged self was a know-nothing opinionated fool, so who cares anyway. I did make a Summer Sun playlist recently, however, to accompany a ‘nearly end of term’ Art team party ­ the first in our newly completed house. The playlist held nearly 200 songs that had either the word ‘summer’ or ‘sun’ in the title. If I do a similar search for songs with the word ‘winter’ in the title, I get around 60. I guess this says something about the nature of Pop, or at least of my Pop, and that is vaguely comforting. That playlist however was a one-off, and if I’ve had a CD that could be said to be close to a Summer Mix this year then it would inevitably be the July reviews playlist. It’s been played a lot, particularly during breakfast as I consumed coffee overdoses in an attempt to wake, and during evening sessions playing Civilization IV in numb from school brain dead stupors. 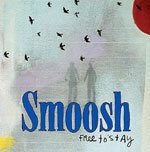 It all kicks off with ‘Find A Way’, the lead-off track from Smoosh’s second album, the fabulous Free To Stay. Now I have written a lot about Smoosh in the past, and feel no real need to add much more now. I feel almost as though the baton has been passed and that they no longer need (if they ever needed) little websites like this to sing their praises. Indeed, if the evidence of the Yahoo mailing group is anything to go by, the storms of rabid interest that they are whipping up around the globe prove that point perfectly. And didn’t they recently have a double page spread in one of the glossy UK Sunday supplements recently? Whatever. ‘Find A Way’, as I pointed out after seeing them perform it live some months back, is a classic Pop Song that should by rights be storming to the top of singles charts the world over. It sets the scene perfectly for the album, being an infectious and invigorating blend of youthful exuberance, supreme confidence and nervous anticipation. Smoosh make priceless, peerless Pop and you would need to be braindead and heartless to fail to recognise it. The Organ make priceless, peerless Pop too, though on the evidence it would seem that braindead and heartless is the way for the youth of the UK to be these days, for as far as I know this ‘Let the Bells Ring’ single singularly failed to set any charts alight in the way that it ought to have. In my world though it was playing for months on end, which is why it’s the only track on this July mix that’s effectively an interloper from earlier in the year. I’ve heard some say of The Organ that they do not break any new ground, that they sound quite predictable and traditional. I see their point, though I personally consider these things to be part of the appeal. For The Organ understand the formula of great Pop and manage to construct such sublime moments from their gloriously, intentionally limited palette. The Organ understand the appeal of space more than most, and their songs breathe deliciously under crystalline coverlets of prickling guitar lines and organ sighs. And it’s never better than on this single, sitting neatly in my cabinet of curiosities between Phil Ochs and The Aislers Set. Fine company to keep, I’m sure you will agree. I wrote briefly about Gothenburg’s Audrey just over a year ago, on hearing their eponymous EP for Stereo Test Kit. Well, now the same label gives us their debut album in Visible Forms, from which I have plucked opener ‘Mecklenburg’ to grace my mix. It’s a track of rare gravitas and beautiful composure that sets up the whole album perfectly, weaving as it does threads of Bjork, Rachels, Low, Sigur Ros, Dirty Three et al to make a brooding, spooked Scandinavian Gothic sound that glistens with morning dew and that gives off the scent of yellowed sketchbook pages filled with collaged memoirs and coded scrawls of obsessive recording. Another reference point would be Edinburgh’s criminally undervalued Electrum, whose deftly muscular melodies and seductive nuances of spectral magnificence are reflected in Audrey, but with the added texture of gloomy strings that sigh like the morning after hearts were broken. Visible Forms is the audio equivalent of the faded glamour that inhabits 19th Century mansions, forlornly abandoned and sectioned into decrepit apartments or seedy hotels as their former owners moved out to suburbia and the country to escape the urban sprawl, leaving behind their ghosts of something old. Beautifully musty, dusty, tattered and torn. So it might seem daft to put a song called ‘Wintercold’ on a July mix (unless you live in the Southern hemisphere of course, in which case it would seem eminently sensible), but I could not resist the irony of the act nor the brilliance of the track in question. 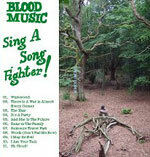 It comes from Blood Music’s Sing A Song Fighter on Static Caravan / Make It Happen, an album that includes a song called ‘It’s A Party’ that Jens Lekman said sounded like the song he has been trying for ten years in vain to write. Of course I think Jens is being unfairly harsh on himself, but certainly any fan of Lekman’s will find a kindred spirit in Blood Music’s singularly special singer-songwriter Karl-Jonas Winqvist (of critically acclaimed First Floor Power). There are aesthetic links too to the likes of Herman Dune, or to Hidden Cameras, to whose ineffable grasp of lyrical poise and naturally challenging melodic inspiration this set also nods with a salacious wink. Due for release on August 21st, Sing A Song Fighter looks set to be as big a fixture in my late summer listening as it has been in the height of the sunshine blasted days of July. If you have any sense you will make it so yourself. We cross the world from Stockholm to Detroit now for a track from Denise James’ new Promises set for Rainbow Quartz. I’ve been a big fan of Denise James since I heard her eponymous first album for Poptones all those years ago, and I’m always delighted to see a new record appear. This time around though Denise has fleshed out her sparse French style Pop textures with a more expansive sound, full of Byrds jingle jangle mornings, Lovin’ Spoonful hooks, Mamas and Papas harmonies. Produced by Matthew Smith (Slumber Party, Outrageous Cherry, The Go), Promises sees Denise James really turning up the heat, delivering an album that is soaked in a ’60s Pop vibe that, like the Pipettes for example, never feels forced or gets in the way of making a gloriously special racket that feels utterly contemporary. And frankly, if songs like ‘It’s Never What You Say’, ‘Let’s Take The Day Off’ and ‘What Happened To The Love We Knew’ aren’t super summer smashes in your life this August, then you surely have no soul. Time to turn down the flames now with a lovely trio of downbeat gems. First up is the ‘Are You A Dreamer?’ cut from Denison Witmer’s album of the same name (on Bad Taste records). The cover sticker says that the album features guest performances by the likes of The Innocence Mission and Sujjan Stevens, and certainly this is going to appeal to anyone who has had their lives lit up by the glorious records made by either of those. And Are You A Dreamer? will certainly find more than a welcome home in any collection that holds, say, Stevens’ Illinois set as one of the finest records of last year. With a crystal clear and comforting clarity, Denison Witmer delivers a record of supremely measured, quiet confidence. Are You A Dreamer? is a rare downbeat treat that you would do well to check out. There is a similar undertow of restrained quietude on The Baker Boys’ lovely Driftwood Boats. I’ve been a fan of Gavin Baker’s work for the likes of Billy Mahonie and as Meets Guitar for a while now, and it’s nice to see him at work here with his father Dave, with additional input from Caroline Nesbø. It seems that this is one of 52 albums being released over the course of 2006 by Unlabel, at a rate of one per week. It’s an ambitious project, and if all the records are at least nearly as interesting as Driftwood Boats then it’s got to be worth checking out. The vast majority of the tracks on the set are traditional folk songs, although there are also covers of Rocky Erickson’s ‘I Love The Living You’ and the Byrds’ ‘Fifth Dimension’ which perhaps helps to give an idea of at least where some of the Baker Boys’ influences are coming from. For anyone with an interest in contemporary folk stylings, this is essential stuff. Similarly, the Ghost Man On First set by Currituck County is an intriguingly strange set of 21st Century folk. The sleeve proclaims it to be part one in a three part lecture series, which is a fascinating concept seemingly designed to throw a series of spotlights on some of the band’s source texts and inspirations. And whilst tracks like the traditional ‘I Truly Understand’ and the cover of Bert Jansch’s ‘Silly Woman’ (from his 1971 Rosemary Lane set) are fine enough reference points, it’s the Carrituck originals like ‘Requiem for John Fahey’ and ‘Dedication: Fred Neil’ that are most interesting to me, making as they do the influences tangential and more intriguing. And if those reference points are perhaps somewhat obvious, that’s okay, because whilst those older heads amongst us will be more than familiar with the likes of Fahey, Neil, Jansch etc, there are always new generations in need of a nod in the right direction. And Carrituck County are doing a fine job of making some deft nods indeed. Speaking of Fred Neil, everyone of course knows of his classic ‘Everybody’s Talking’ which was such a huge hit for Harry Nilsson in 1969 and then appeared to such sublime effect as the title theme to Midnight Cowboy. 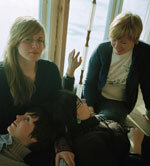 Well, the song also crops up on the Elephants Memory album that Lemon Recordings recently put together. It collects their two tracks originally included on the Midnight Cowboy film soundtrack along with a bunch of other cuts that were somewhat hastily slung together for a 1969 cash in. The band were perhaps more famously known as the group selected to be John Lennon and Yoko Ono’s backing band, but don’t let that put you off! 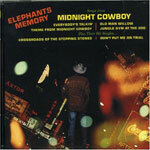 Songs From Midnight Cowboy showcases a fine late ’60s band crossing the divides between rock, psychedelia, blues and folk to fine effect. And incidentally, Midnight Cowboy remains for me one of the most enduringly appealing movies of all time and I really must get around to watching it again some time soon. Well, isn’t that what holidays are made for?